At the inferior end of the trachea, the airway splits into left and right branches known as the primary bronchi. The left and right bronchi run into each lung before branching off into smaller secondary bronchi. The secondary bronchi carry air into the lobes of the lungs—2 in the left lung and 3 in the right lung. The secondary bronchi in turn split into many smaller tertiary bronchi within each lobe. The tertiary bronchi split into many smaller bronchioles that spread throughout the lungs. Each bronchiole further splits into many smaller branches less than a millimeter in diameter called terminal bronchioles. Finally, the millions of tiny terminal bronchioles conduct air to the alveoli of the lungs. As the airway splits into the tree-like branches of the bronchi and bronchioles, the structure of the walls of the airway begins to change. The primary bronchi contain many C-shaped cartilage rings that firmly hold the airway open and give the bronchi a cross-sectional shape like a flattened circle or a letter D. As the bronchi branch into secondary and tertiary bronchi, the cartilage becomes more widely spaced and more smooth muscle and elastin protein is found in the walls. The bronchioles differ from the structure of the bronchi in that they do not contain any cartilage at all. The presence of smooth muscles and elastin allow the smaller bronchi and bronchioles to be more flexible and contractile. The main function of the bronchi and bronchioles is to carry air from the trachea into the lungs. Smooth muscle tissue in their walls helps to regulate airflow into the lungs. When greater volumes of air are required by the body, such as during exercise, the smooth muscle relaxes to dilate the bronchi and bronchioles. The dilated airway provides less resistance to airflow and allows more air to pass into and out of the lungs. The smooth muscle fibers are able to contract during rest to prevent hyperventilation. The bronchi and bronchioles also use the mucus and cilia of their epithelial lining to trap and move dust and other contaminants away from the lungs. The terminal bronchi and alveoli are located at the very end of the conducting zone and the beginning of the respiratory zone in the respiratory system. 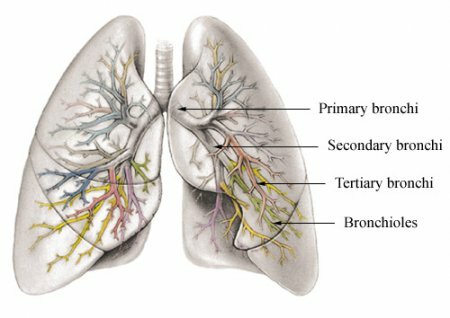 The bronchi (or bronchus) are the air passages into the lungs that begin at the end of the trachea. There are two bronchi, one for each lung. The bronchus divide into smaller branches known as segmental bronchi, which divide again into bronchioles, and then again into terminal bronchioles. Each terminal bronchiole separates to create respiratory bronchioles that have alveoli, which are small, balloon-like sacs at the end of the small air passages in the lungs (the bronchiole). Oxygen is inhaled and absorbed into the bloodstream through the thin walls of each alveolus, by way of the pulmonary veins. Carbon dioxide from the pulmonary artery is exhaled as a waste product of the lungs. The greater the surface area the lungs have for gas exchange, the greater is their efficiency to absorb oxygen. The 700 million (or more) alveoli found in both lungs, if flattened out, would cover an area of some 50-100 square yards. This is approximately the size of a tennis court, and is all neatly folded and bundled into the chest cavity. Each alveolus has a wall that is only one cell thick. A capillary wall has about the same thickness. The distance between air and blood is about 1/1000th of a millimeter. The oxygen is transported by the red blood cells, which squeeze single file through the pulmonary capillaries. Red cells are packed with hemoglobin, or red pigment, that attracts the oxygen. Carbon dioxide is diffused in the same way back through the capillaries and alveolar walls to be exhaled. The enormous surface area of the alveoli and the short diffusion distance between alveolar air and capillary blood quickly allows the blood to achieve equilibrium with gases of the alveolar air. This function is further increased by the fact that each alveolus is surrounded by a capillary network so extensive that it forms an almost continuous sheet of blood around each alveolus.